I remember the joy of getting an Easter basket as a kid. We would put our baskets out on the table the night before Easter and the Easter Bunny would fill them with candy and other goodies while we were asleep. I always had the cheap store-bought Easter baskets but if I were going to make Easter baskets for kids today I'd definitely make crochet Easter baskets. Here are 10 free crochet Easter basket patterns for those of you who are thinking the same thing! Note: You could also adapt many of these patterns to work as gift baskets and home decor items all throughout the year. Never limit yourself to just one holiday when working with a crochet pattern! The adorable bow is my favorite part of this free crochet pattern from Jen of Jam Made. However, I also love the rainbow striping. Easter is all about springtime and springtime is filled with colors and rainbows! This fun crochet basket is also good just for gathering flowers or berries! This free crochet pattern from Petals to Picots is decorated with flowers so it would work for any springtime occasion, in addition, to use as an Easter basket. Crochet one of these baskets, fill it with additional crochet flowers and make it a great display item for your home. I love how colorful crochet looks but the truth is that I don't like changing colors in my own work so I appreciate a good single-color textured crochet project like this basketweave basket from Planet M Files. It adds rich coziness to the room and would work as an every day basket, not just as an Easter basket. Suzie's Stuff has another Easter basket crochet pattern that's only got a small color change, offering a pop of brightness to make it intriguing to the eye. This one can be made with or without a handle; the versatility makes it adaptable to different needs. Do you need a tiny crochet Easter basket, sized for just one egg or perhaps a little bit of candy? These would be perfect for Easter gifts! You could also adapt the colors and use it to give Christmas gifts or gifts for Valentine's Day. There aren't too many square crochet Easter basket patterns so the shape sets this one apart. The pastel colors and the flower still make it a feminine springtime basket. 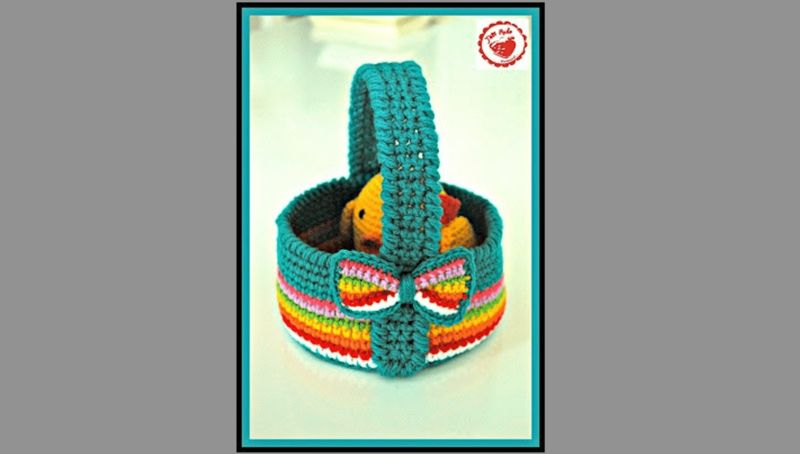 This free crochet pattern by Lindsay Obermeyer is worked in single crochet so it's a simple beginner crochet pattern that creates a sturdy, durable, reusable crochet Easter basket. This free crochet Easter basket pattern is worked in neon twine so it's an interesting project that's different from a lot of other patterns most of us have worked before. It's another durable, fun crochet basket. Designer Jennifer Pionk of A Crochet Simplicity created this free crochet pattern in three sizes. If you have three kids of different ages then it could be fun to make one in each size! Technically Julie of Gleeful Things didn't design this as an Easter basket per se. However, it's the perfect springtime colors so I definitely think it could work if you wanted to use it as an Easter basket!